Did work or some other type of trauma cause a firefighter paramedic to develop post-traumatic stress disorder (PTSD)? The answer to that question is the key to whether he receives workers’ comp benefits. Royce Munker worked for the City of Norfolk in the Department of Fire-Rescue for 18 years. He worked as a firefighter paramedic for 17 years, and then was a fire inspector for a year. After being an inspector for a year, Munker was told he’d be reassigned as a firefighter paramedic. The news caused him to suffer a panic attack for which he sought medical treatment. During his years as a firefighter paramedic, Munker said he responded to “a lot of bad calls.” He saw decomposing and charred bodies of adults, babies and animals, and shooting victims with “blood everywhere,” and on one call had a knife pulled on him. While assisting in post-hurricane relief efforts, Munker said he saw bodies and coffins floating in the water. He was also threatened by a looter with a gun. After hearing that he would go back to firefighter paramedic work, Munker saw a licensed clinical social worker and a psychiatrist. In the course of seeing them, both said Munker suffered from PTSD due to his work as a firefighter paramedic, including his post-hurricane relief work. Munker filed a request for workers’ comp benefits, specifically, lifetime medical benefits and temporary total disability. A deputy of the Virginia Workers’ Compensation Commission (WCC) found Munker suffered from PTSD but failed to prove it was due to his work. The deputy found Munker’s PTSD was “based on work-related exposure to traumatic events as well as exposures to traumatic events outside of his employment, including his service providing post-Hurricane Katrina relief.” In other words, Munker didn’t prove his PTSD didn’t result from causes outside of work. The full WCC reversed the deputy’s decision. The Commission said while Munker had suffered other personal trauma, his medical providers said his PTSD was caused by work – including participating in Hurricane Katrina relief. “But for [Munker’s] training as a paramedic, he would not have been called to serve in that rescue effort,” the WCC wrote. The City of Norfolk asked a state appeals court to reverse the Commission’s decision. Is his PTSD an occupational disease? The Virginia Supreme Court had previously ruled that PTSD can be compensable under workers’ comp, if it can be shown it’s an occupational disease. The City of Norfolk argued that in Munker’s case, PTSD wasn’t an occupational disease, but rather a non-compensable ordinary disease of life because he was exposed to traumatic events outside of work. His employer argued that Munker’s exposure to other traumatic events, including in his family life and childhood, demonstrated his exposure to traumatic events occurred outside of his employment. The appeals court rejected that argument. It noted the opinions of the social worker and psychiatrist that Munker’s work experiences caused his PTSD. The City also argued Munker’s work in post-Katrina relief efforts wasn’t working for his employer. The Commission had found Munker would not have assisted with post-Katrina relief efforts “but for” his training as a paramedic and that the traumas he experienced there were related to his firefighter paramedic work. The appeals court reversed the decision and remanded the case for the WCC to determine whether Munker’s post-Katrina relief effort was the same “work or process” of a firefighter paramedic. Munker says it was. It’s now up to the Commission to decide if it agrees with him. It is sad that the City of Norfolk is willing to dispute something like this. Firefighters, Paramedics, Police, Soldiers/Sailors, and other types of first responders in my opinion are “on the job” 24/7. We are trained and mentally wired to respond to traumatic events, and our minds absorb those traumatic events regardless if we are “clocked in”. The story doesn’t describe why the Post Katrina response is especially significant to this case, especially since Mr. Munker referenced “a lot of bad calls” over his long career that are no different. Hopefully the full WCC board rules as they did before and grants this to him. 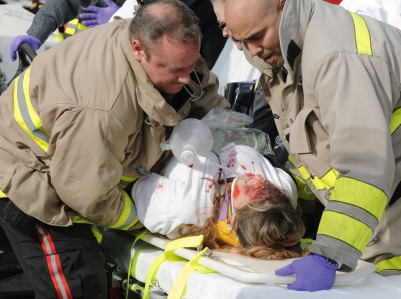 Firefighters and paramedics can absolutely expect to see “a lot of bad calls” over their career. They know this before they are even hired. Claiming PTSD and life-time benefits for routine job experiences is a load of crap. I was a FF/PM for much longer than 18 years and saw some truly horrifying things that I have NEVER spoken of. I wouldn’t even dream of making a PTSD claim for them. Seeing a lot of bad things is part of the job. You know that when you sign up. He had routine experiences. Working in telecommunications, of your own free will, during the Katrina clean-up hardly qualifies as being traumatized. Then he went back for a second trip? Come on. This whole thing sounds like a load of BS. Also, if he was so very traumatized, why is he in school to be a respiratory therapist where he will not only be responsible for “putting tubes in people’s throats” but also for turning off life support? I’m a retired firefighter/paramedic and all I see here is someone trying to scam the city he worked for.